MultiBrief: Steel-toe or composite-toe work shoes: Which should you choose? Steel-toe work shoes are more or less the industry standard when it comes to foot protection. These help prevent injuries to the toes in the event a heavy object falls on or rolls over them. In fact, the Canadian Centre for Occupational Health and Safety requires employers to ensure their workers are equipped with foot protection equipment if there is a risk of injury to the feet during the course of performing a task. Steel-toe safety shoes fall under this category. Steel-toe shoes have been around since about the early 20th century, but composite-toe work boots have appeared on the market recently as an alternative. As far as safety shoes go, composite-toe foot protection has proven to be an ideal alternative due to the properties inherent to the material. However, both steel and composite have their advantages and disadvantages. One advantage composite-toe work boots have over their steel counterpart is weight. Composite material is lighter than steel. Consequently, composite-toe boots are lighter than their steel-toe cousins, sometimes up to 30 percent lighter. This makes composite-toe protective footwear ideal for workers who have to do a lot of walking, such as postal or delivery workers. Also, composite material doesn't set-off metal detectors, so for workers who have to pass through metal detectors several times a day, work shoes with composite toes can potentially save time. Another advantage composite material has over steel is in heat and cold conduction. Obviously, steel is a better conductor of both heat and cold. This makes steel-toe boots more susceptible to the cold compared to those with composite toes. In fact, composite material is actually a good insulator. Individuals who have to work outdoors in extremely cold weather may want to consider composite-toe work boots. At this point, you may be thinking steel-toe work boots are the inferior product. However, steel-toe work boots also have a couple of advantages over these composite-toe upstarts. One such advantage is in protection against sharp objects. Steel can resist punctures and cutting better than composite material — at least the composite material used for work boots. As such, when working around bladed machines, steel-toe work boots will protect your feet better in the event that a blade should come loose and fall on your toes. Cost is another area where steel-toe shoes have the advantage over composite-toe ones. Composite-toe work shoes are generally more expensive than steel-toe ones. This makes steel-toe safety shoes the more practical choice. It has to be mentioned that there is a well-known urban legend stating that the toe cap of a steel-toe work boot can shear off a person's toes if a heavy enough object falls on it. This makes a good argument for the use of composite-toe work boots since composite material is not exactly known for its cutting properties. However, this legend has long been debunked. In fact, if a heavy enough object falls on your toes, it doesn't matter what type of work boot you are wearing. You will most probably lose your toes. The bottom line is both steel-toe and composite-toe shoes can effectively protect workers' toes from injuries resulting from falling heavy objects. Both have to pass government safety standards before they can be classified as safety shoes. 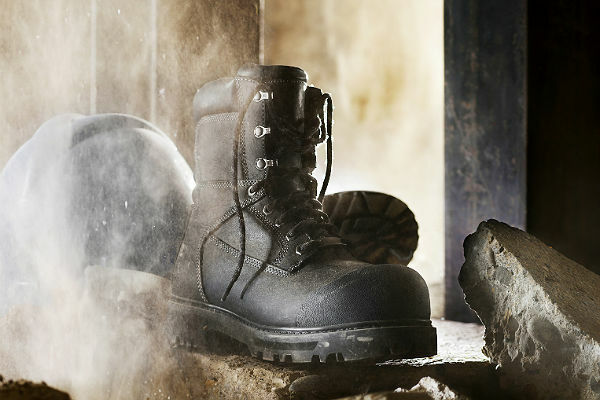 While there are certain working conditions where composite-toe work boots are more ideal to use, steel-toe work boots can still be considered the industry standard when it comes to safety work shoes. Noel E. Dugenia works as a lead content creator for Brady, writing and editing content for its subsidiary Seton.ca. He graduated with a diploma in culinary arts, but found his real calling creating content that pushes safety initiatives in general industry.